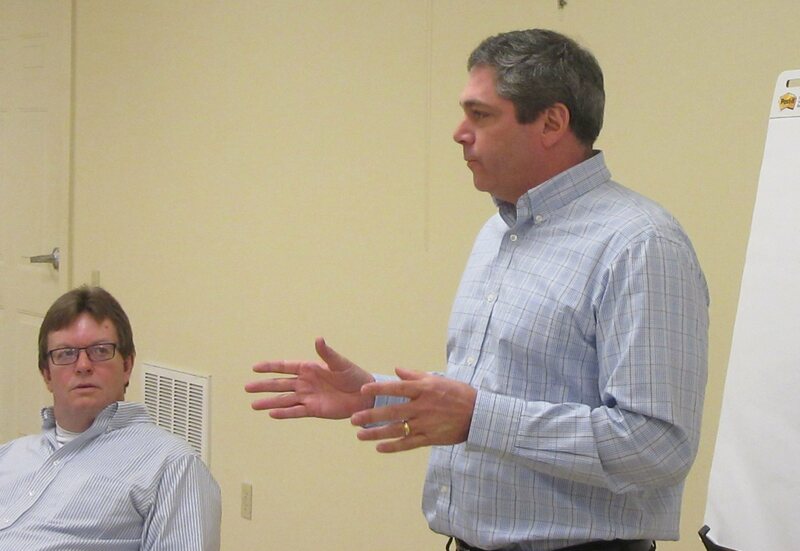 Endless Mountains Heritage Region board members (top) listen to a presentation by Todd Salsman, treasurer Wyalusing Community Corporation, during a meeting held in WCC’s Tuscarora Wayne Room in Wyalusing on Dec. 7. Salsman (above, right, with EMHR board member Kevin Abrams) spoke of recent changes at the building and the WCC’s desire to make more use of the space, including more frequent rental of the Tuscarora Wayne Room for meetings and private parties. 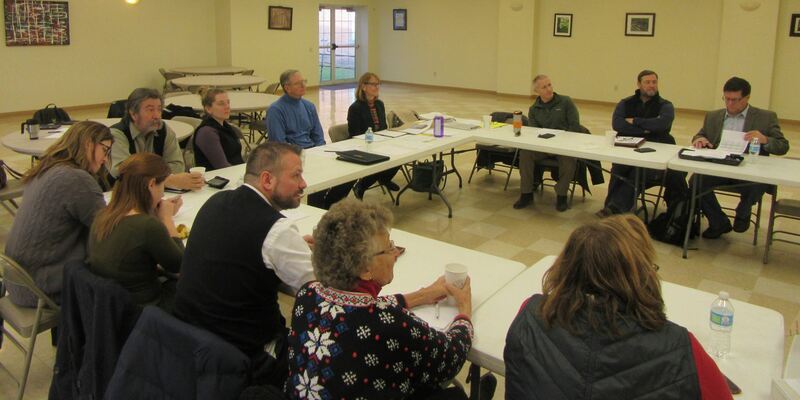 The Endless Mountains Heritage Region (EMHR) held a pair of meetings on Dec. 7 in the Tuscarora Wayne Room in the Wyalusing Community Corporation (WCC) Building on Main Street, Wyalusing. WCC has twice been the recipient of project funding through EMHR, and EMHR board members have used the facilities on several occasions. On Dec. 7, board members heard from WCC treasurer Todd Salsman about a renewed focus on making the space more accessible to the general public and other organizations. Recent changes include a move by the Greater Wyalusing Chamber of Commerce out of the building and the closing by WCC of the Blue Heron Art Gallery. “We didn’t have a full-time curator,” Salsman explained. WCC members were identifying other priorities and decided the gallery could not be run efficiently on a part time basis. “We want to maintain the historical building and increase the use of the Tuscarora Wayne Room,” Salsman said of the spacious banquet and meeting hall and catering room at the rear of the former McCarty Garage and auto showroom. That, he says, better fits WCC’s mission of supporting local businesses and historical preservation. Salsman thanked the EMHR board for facilitating funds that helped with the restoration of the former car dealership into a community center. EMHR also helped with funding for the “Front Door to Route 6” project, which included new sidewalks and the installation of classic-style street lights between the WCC building and Route 6. In addition to Salsman, WCC officers include Chris Woodruff, president; Carol Goodman, vice president; and Wes Skillings, secretary. Readers interested in renting the Tuscarora Wayne Room can leave a message for Goodman at 570-746-6070. The EMHR regular board meeting at which Salsman spoke was preceded by a discussion about the EMHR Management Action Plan, which will be completed for review over the next week. The summary highlighted some new directions and initiatives that executive director Annette Schultz would like to see the organization pursue over the next year, including developing scenic and historic driving routes and off-road hiking and biking trails, expand EMHR’s membership base, enhanced promotion of the Susquehanna River North Branch Water Trail as a destination, and planning for EMHR’s 20th anniversary in 2018. Highlights of the regular board meeting included an announcement that the Endless Mountains Resource Conservation and Development Council will be renting office space on the second floor of EMHR’s headquarters in Towanda, an analysis and review of DCNR grant contracts, an announcement the organization’s website will get a complete overhaul in early 2017, and signing up by board members for next year’s committees. It was noted that committee members do not have to be standing board members and can include anyone with expertise in an area of particular concern to the EMHR. For more information the EMHR, interested readers can log on to www.endlessmountainsheritage.org or call 570-265-1528.